Photographing a late winter garden. Last September I wrote about how I like photographing my wife’s garden in every season and I didn’t really care about the weather conditions. I mention here that the more uninviting the elements better I like the photography. 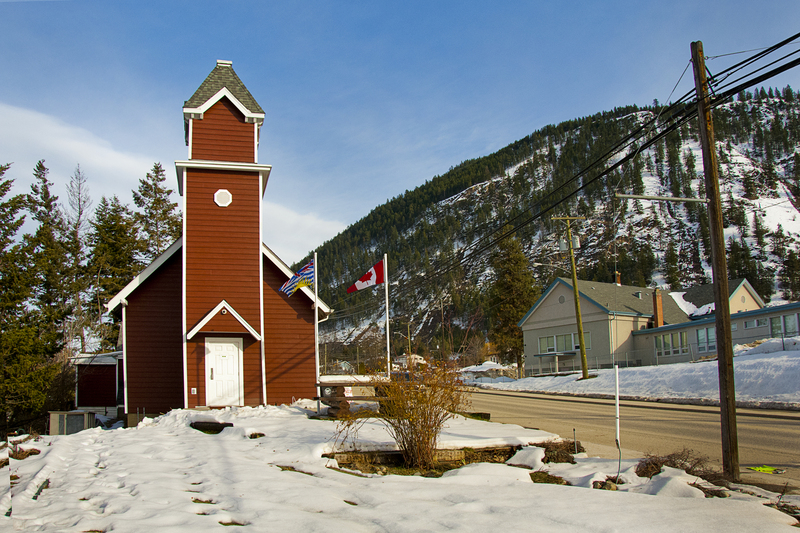 The day here in the interior of British Columbia wasn’t really cold, it was only about -3 Celsius. 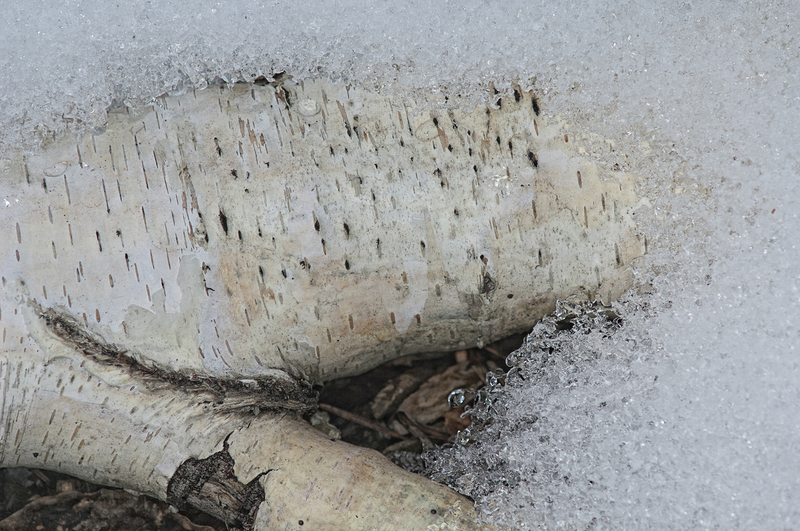 With a slightly overcast sky I knew it would be perfect for photographing things poking out of the snow. 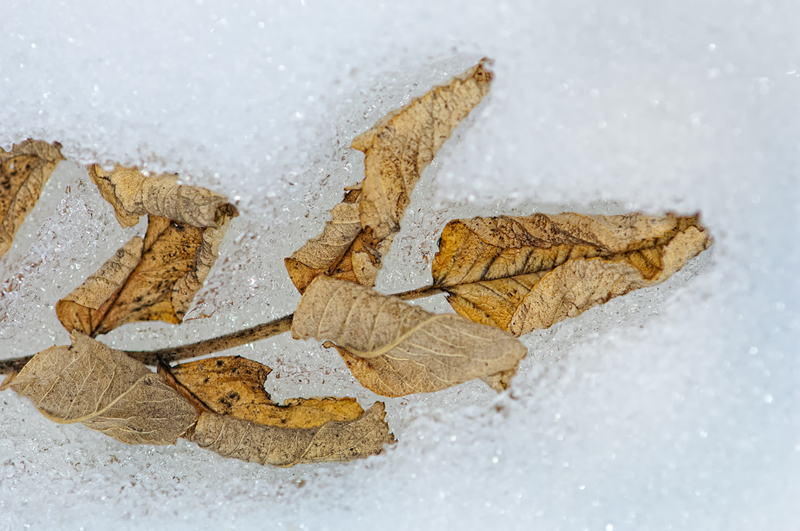 I mounted my 200mm macro on my camera and connected a ring flash on that and stepped out into the snow-covered garden. We had lots of snow this winter and if one digs down the soil is damp and unfrozen. 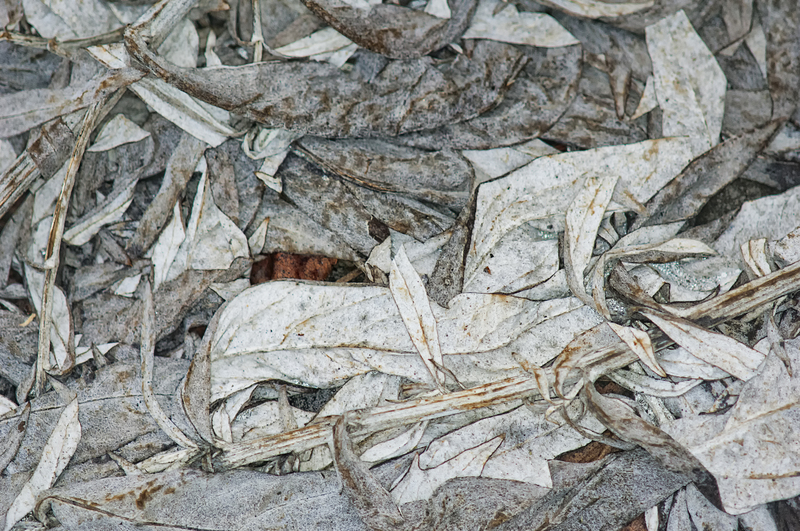 The images I made last September were of dried out faded plants with a golden hue. 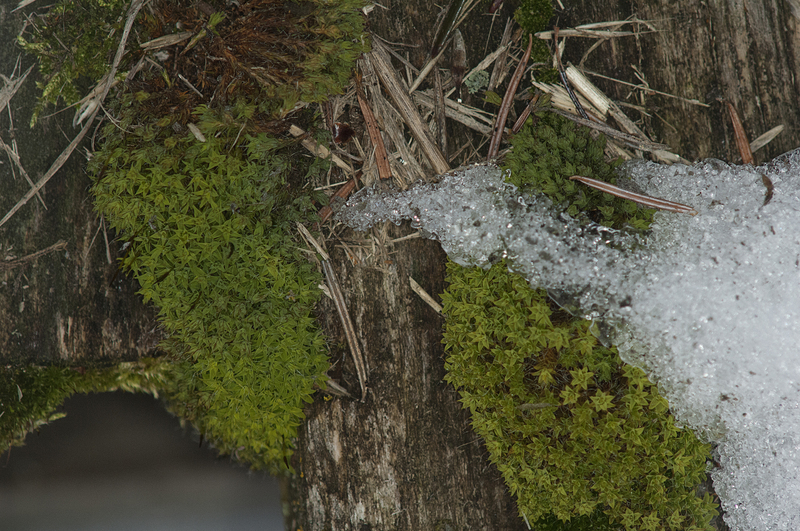 But as I wandered around this time I found more than one green plant sticking out of the slowly melting snow. The deep, powdery snow that I had been photographing in all winter had turned crusty and no longer clung to the trees. There had been enough of a melt that I even could see some of the garden hose I forgot to put away last fall. I mentioned that the overcast day was perfect for my subjects. Bright sunny days increase the contrast of scenes, especially snow covered ones, making it hard to capture details in the extremes and I wanted to retain what details I could. The diffused daylight reduced the number of f/stops from black to white. I used a ring flash. That is a flash that mounts around the front of a lens and can emit a soft direct light towards small subjects. When I add flash to a daylight scene I usually underexpose the ambient light and create fill light with the flash. My ring flash doesn’t have the TTL technology with which modern flash users are familiar. I must first determine the exposure, remembering that the shutter controls ambient light and flash intensity is controlled by the aperture. The flash is constant power, but can be full, quarter or sixteenth power output. I began by photographing tall plants, but the small features poking out of or just above the snow seemed more interesting and instead of looking eye level I wandered searching the snow covered ground at my feet. 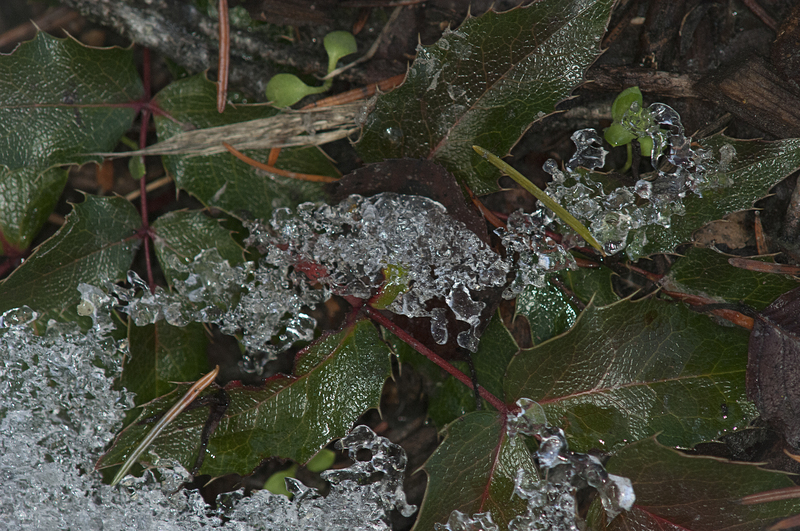 I wandered around with my tripod searching the snow-covered garden for intriguing shapes. Just about anytime is good for a dedicated photographer to make photographs. My advice is to be creative, have fun, and don’t worry about failures. Open them up on the computer, learn something from them then quickly delete. Of course, some tweaking with PhotoShop always helps and, for those photographers that like me are trying for something different, anytime, and any conditions will be just fine. The pictures I see of cities and towns are usually of exotic locations, and show glamorous and architecturally interesting buildings. I admit that I enjoy photographing cityscapes and easily loose track of time when I am left to wander about on my own in just about any high-building packed city. Recently, I have been fortunate enough to view the colorful building photography by Australian photographer, Leanne Cole, at http://www.leannecole.com.au and French photographer, Mathias Lucas’ architectural work at http://mathiaslphotos.wordpress.com. Both photographers got me to think about winter building photography, but, for me, it is a drive of many miles from my rural home to a city with tall buildings. 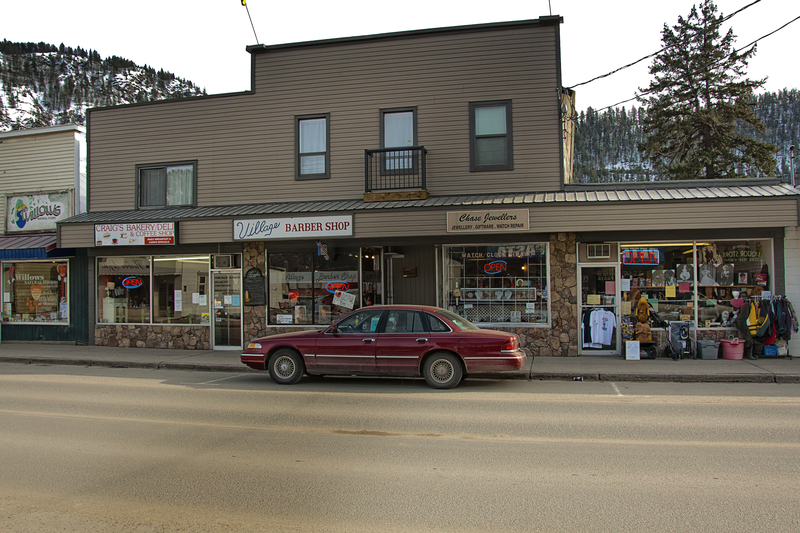 I wondered about small communities that are scattered along the Thompson River valley. Most aren’t glamorous, or exotic, and although there might be some architecturally interesting buildings left from bygone times, they are often treated by most travelers as convenience stops on the way to somewhere else. 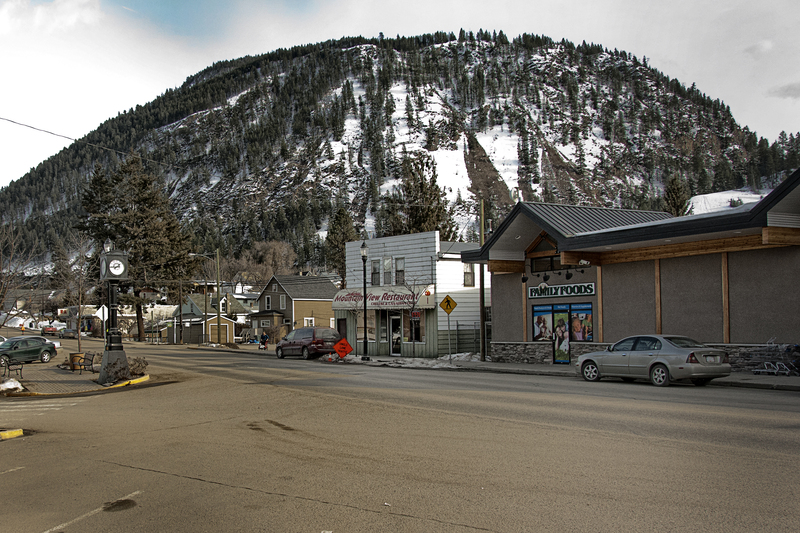 Not far from my backwoods home is the small lakeside town of Chase. When photographers go there they pass through the town center with barely a glance on their way to the park beach and boat pier. 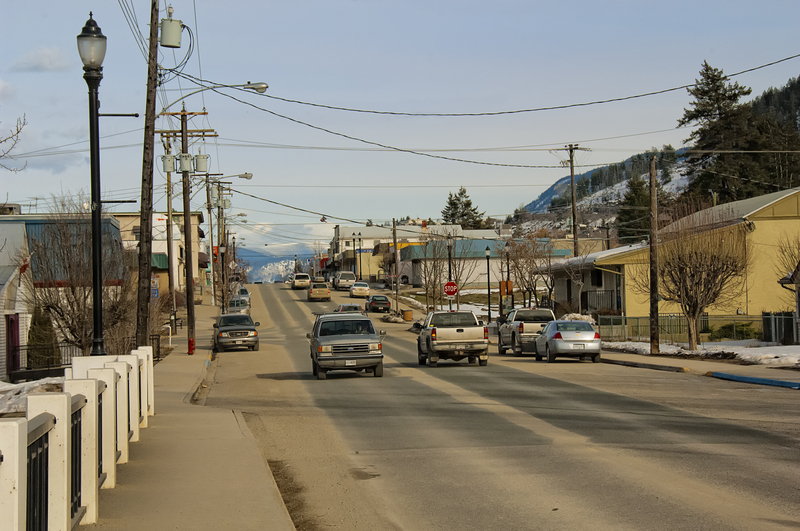 The single-street town isn’t really significant to view with its single story, flat-topped, mostly featureless buildings, and I go to Chase as a place to get something forgotten from my main shopping trip to the larger city of Kamloops where I work. I sat looking at Lucas’ and Cole’s engaging building images, and even searched out some of my recent files from my October trip to Victoria, British Columbia, and wondered if I might be able to make some interesting photographs of that little village up the valley. The day had climbed above freezing with some patches of blue sky. I mounted an 18-200mm lens on my camera and headed off on the short drive along the Thompson River to Chase. My choice of an early afternoon, midweek day was perfect. There were a few vehicles parked at the city curbs, the traffic (unlike on a weekend) was light, and I could easily walk across the street anytime, and I even stood center-street for a few shots. I took my time wandering along trying different angles, exposures and took more than one shot of each scene choosing different cars, trucks, people and buildings in my quest to make interesting images of the village. I always can tell local residents. They are the ones that don’t mind a photographer, smile, and say hello as they pass. Tourists seem impatient, avert their gaze, and quickly walk past as if my camera is stealing something. Photography in larger centers is easy, sometimes overwhelming, and always exciting. 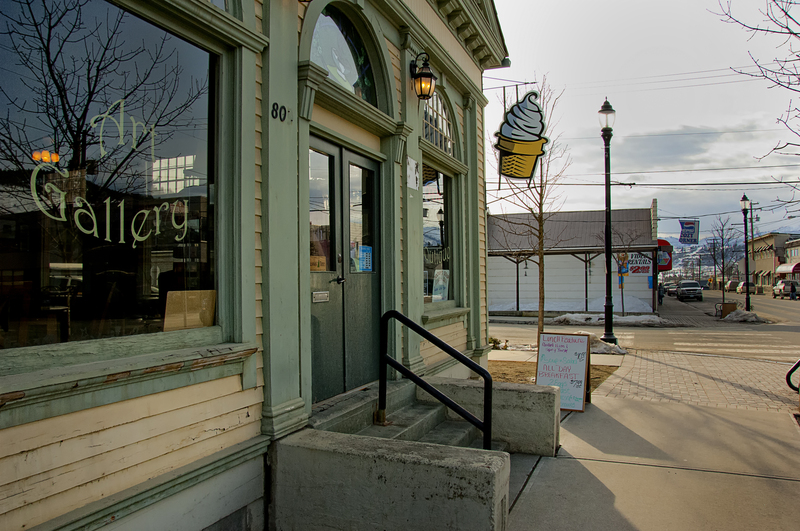 However, one has to get in the mood and culture when photographing small towns like Chase. I suppose it’s all about trying to observe the town with a thoughtful attitude. 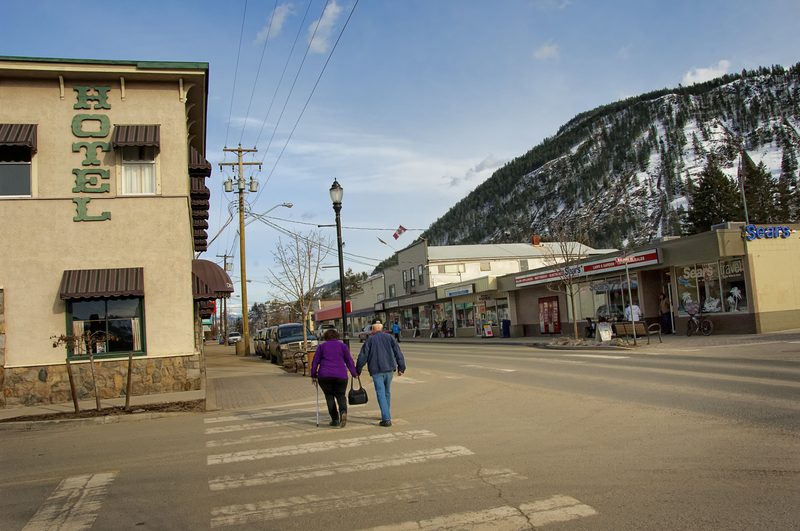 I made lots of pictures of that small town for this article and included only those that showed the village in its valley location. In any event, I was pleased with the results of my adventure in Chase. In my experience going over ones pictures with a fresh look days later is always a good idea and I intend to do that and may post them sometime later. I know there are many photographers living in the towns along the British Columbia, Thompson River valley; yet, I rarely see creative work showing the places they live. For years I have attended local art shows that always include local photographers who try their best to produce art-worthy images, but I can’t remember seeing any depicting Chase or any other small city here in the interior. I suppose we become too familiar with our homes and don’t take the time to observe and photograph an interesting view that comes from an ordinary place. I encourage readers to take a new look. My friend, Dave Monsees, decided to host another Strobist Meet-up at his photography studio, and I was definitely up for that. I like trudging around photographing snowy scenics, but, the thought of spending a photo-filled day in a warm, wood-heated studio was enticing, and when he extended the invite I didn’t hesitate to accept. 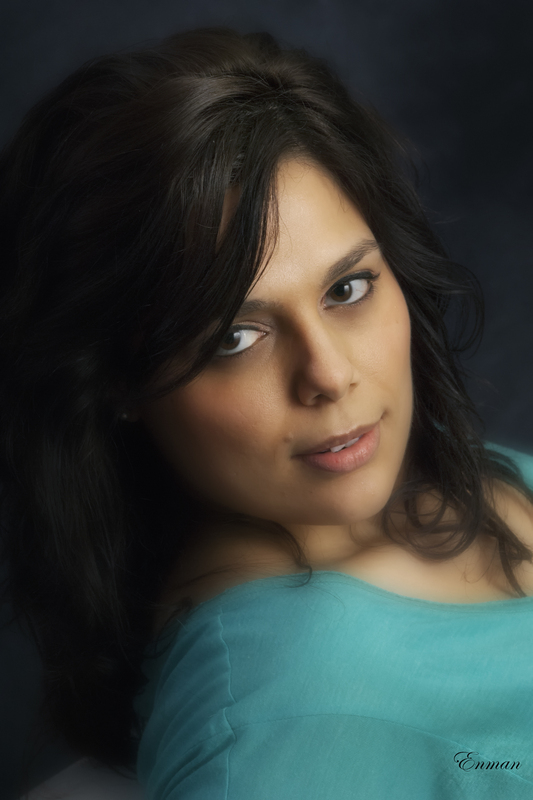 My request to the other photographers was to continually change the two lighting setups that we were using. I had participated in past meets, and, they were fun and photographers got to make lots of pictures of models; however, even though the resulting pictures were great, the lighting remained basically static for every image. For this day I wanted to change the modeling lights and modifiers every hour. That meant photographers and models had to rethink what they were trying to do, but after the first change everyone got into the swing and began to get really innovative. Photographers changed lenses, shooting angles, helped each other out by moving the lighting around, and our models went through several clothing changes and were as involved in the creative process as the photographers. The studio had lots of lighting equipment set up with wireless camera connectors for each photographer. There were two different backdrop set-ups, and we had our choice of lights and modifiers like softboxes, umbrellas, snoots, barn doors, and reflectors. When I wrote about the last studio meet-up I attended I said that photographers always need to explore and experiment, and get-togethers like this are perfect for practicing off-camera lighting in a studio (that most photographers don’t have access to) without the pressure of actual clients, and it is a fun way to refine one’s skills. Monsees commented that he liked being around fun people with a true passion for photography, and dedicated to off-camera flash. He also said that he enjoyed himself so much that he intends to try to have photographer and model get-togethers in his studio every month if he can. 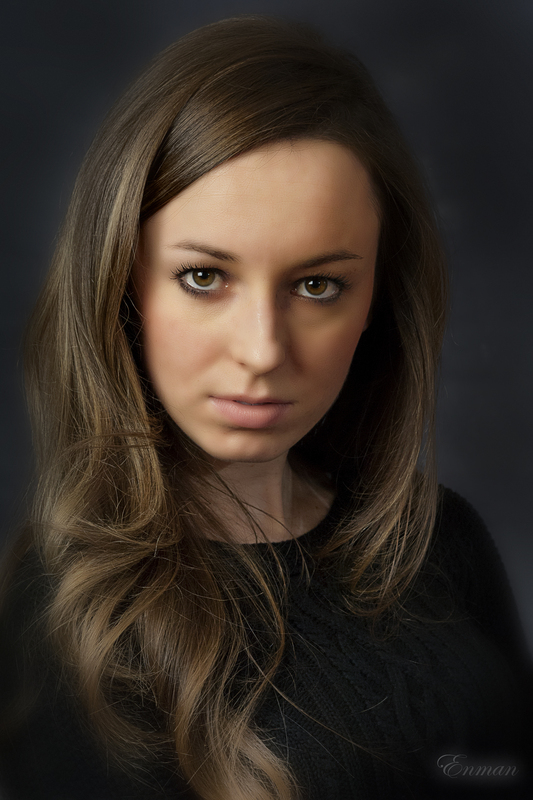 Although photographers have been using off-camera light nearly as long as they have been making portraits of people, that practice has really been limited to a few that owned studios. Recently all that has been changing what with quickly advancing camera technology, and the word “strobist” now refers to a photographer who uses off-camera flash to take pictures, instead of the usual pop-up flash, or hotshoe flash attached on top of the camera. I am often asked, “Why use off-camera flash?” Instead of using just a camera, one must lug around a light stand and a flash. That means carrying extra weight. Sometimes a photographer would require an assistant since weather conditions might knock over the light when shooting outdoors. My response to the question is, “Better pictures.” Light is the language of photography. Without light there are no photos. With off-camera light one adds light and control over the final image. Adding light might introduce drama in a picture and can increase detail or hide it. The extra work greatly affects the output.